Incumbent Brock Falkenberg, endorsed by the Lake County Democratic Party, and challenger Pat Iaccino will meet to discuss the issues. Sponsored by the Lake County Bar Association, Lake County Economic Development Corp. and Lake County News. Join all 3 Superior Court Judge candidates for a debate hosted by LakeCoNews and the Lake County Bar Association. Come meet the DA candidate with a proven record of experience and service to both country and county. Share your thoughts on public safety and the future of justice in Lake County. Join us on May 5, 2018 at the Highlands Senior Center, 3245 Bowers Lane, Clearlake from 3pm-6pm. CONVERSATION & CONNECTION. SPEECHES WILL BE SHORT. LEARN ABOUT THE TWO MEASURES THAT WILL BE ON THE JUNE BALLOT AND HOW THEY COULD AFFECT YOUR COMMUNITIES. Admission is free. Bring your friends. In order to defray costs, individual donations from Democratic activists are encouraged to sponsor the event. Light food, provided by Aroma’s Catering, local wines, beer and soft drinks will be available for donation. The Democratic Party of Lake County endorsed four candidates in races for local office for the June 5, 2018 Primary election. 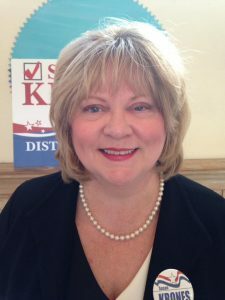 Susan Krones, the Senior Deputy District Attorney, received the party’s endorsement for the open County District Attorney seat. She has 25 years of experience in prosecuting criminal cases in Lake County. Krones started out in the Family Support Division in 1992 and then transferred to the Criminal Division in 1997 where she has prosecuted serious and violent felonies including murder, child sexual assault, domestic violence, vehicular homicide and animal abuse cases, along with other cases. While assigned to the Child Sexual Assault cases, Krones was instrumental in establishing the first child interview center in Lake County for victims of sexual assault. In the Superior Court, Department 4 race for retiring Judge Hedstrom’s seat, the party voted to endorse Shanda Harry for the position. Harry currently serves as Deputy County Counsel for Lake County. Harry is committed to protecting the people of this County while making the system work fairly. Harry has 17 years of legal expertise and an extensive and impressive background as Deputy County Counsel, Deputy District Attorney, Tribal Prosecutor/ICWA Attorney and Litigation Associate for several large law firms. She has experience in all aspects of criminal, governmental and civil law including environmental, child welfare, employment, entertainment, copyright, contract, land use and general business litigation at the Federal and State court level. The Democratic Party of Lake County voted to endorse incumbent Brock Falkenberg for Lake County Superintendent of Schools. Falkenberg is completing his first term as Superintenent of Lake County Schools. His exemplary educational leadership abilities have been recognized throughout his career. He has been recognized as a Teacher of the Year and High School Principal of the Year in Sonoma County as well as Administrator of the Year in Lake County. Prior to serving as the Lake County Superintendent of Schools, Brock served as the Senior Director of Human Resources and Student Programs within the Lake County Office of Education. In the District 2 Board of Supervisor race,Clearlake City Council Mayor, Bruno Sabatier, received the endorsement. Sabatier’s main goals upon his election to the Board are increased access to education, putting our county’s economy back in the positives, and working on solutions to homelessness in our county. Sabatier is an outreach specialist with the Lake County Campus of Woodland Community College in Clearlake. The primary election will be held on June 5, 2018. Deadline to register to vote is May 21, 2018. The Lake County Democratic Central Committee serves as the official representative and governing body of the California Democratic Party in Lake County, carrying out such duties as are consistent with the Elections Code of the State of California and the By Laws and policies of the California Democratic Party and Democratic National Committee. exempt revenue generated by SB 1’s tax increases and fee schedules from the state appropriations limit. A “no” vote opposes this amendment to require a one-time two-thirds vote in each legislative chamber in 2024 or thereafter to pass a spending plan for revenue from the state’s cap-and-trade program. A “yes” vote supports this amendment to move the effective date of ballot propositions, including citizen initiatives and legislative referrals, from the day after election day to the fifth day after the secretary of state certifies election results. A “yes” vote supports this amendment to allow the state legislature to exclude rainwater capture systems added after January 1, 2019, from property tax reassessments. Hold Republican Congressional members accountable. Too many Republicans are hiding from the public – and we deserve to be heard. Plan to attend a local Republican Congressional town hall or call on your local Republican congressional member to host one. Click here to see a listing of visibility events with other unaffiliated allies. Keep checking back for more – they are updating their sites daily – and we will be adding more!